already known as well as ones yet to be met, the ones from just around the corner as well as those from across the ocean, wish you all a warm welcome to TADA365, a Flickr group of artists ready to commit to a daily routine of making continuous progress in their creative venture of completing at least one show-ready collection of art jewelry by the end of the year 2011. I wish to use this opportunity to invite all you shy souls to dust off that insecurity from your creativity and step up with this commitment, gradually work on your abilities through unimaginable encouraging energy that will be given to everyone through this group. You make things by yourselves, but the force behind your work is not solely yours... If you stumble there will be plenty of us to help you get up and get on the ride again. You are not alone here. To those already familiar with all the drills of the trade this is a great opportunity to have more friends, to give birth to all the ideas waiting in line, to be a pillar, support, comfort, inspiration to those who are in need of some help. This blog will commit to be there for all of us who are together on this journey. 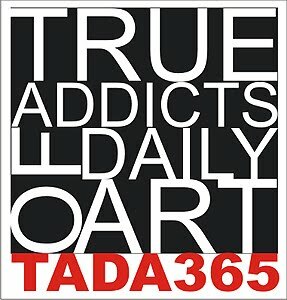 Every day a post will reveal the progress of the members of TADA as well as trying to help solve some problems, sharing helpful links, giving ideas..... anything necessary to reach the goal. So.... WELCOME & ENJOY THE RIDE!!! Thank you for writing this warm welcoming post! Can't wait to get started! Oh me too, I am so happy we are together in this :)Both of you! I'm so happy to be a part of this with you too! How motivating to be creating and learning and sharing ideas together with a goal in mind.